My friend Nicole, and incredibly talented artist, thrift store comber, and fellow-reseller has closed the deal on a larger house for her growing family! She let me document her old pad, a large rental house, so we can remember it before she moves on to the new space. I'll certainly be back to document the gorgeous new one when it's ready. 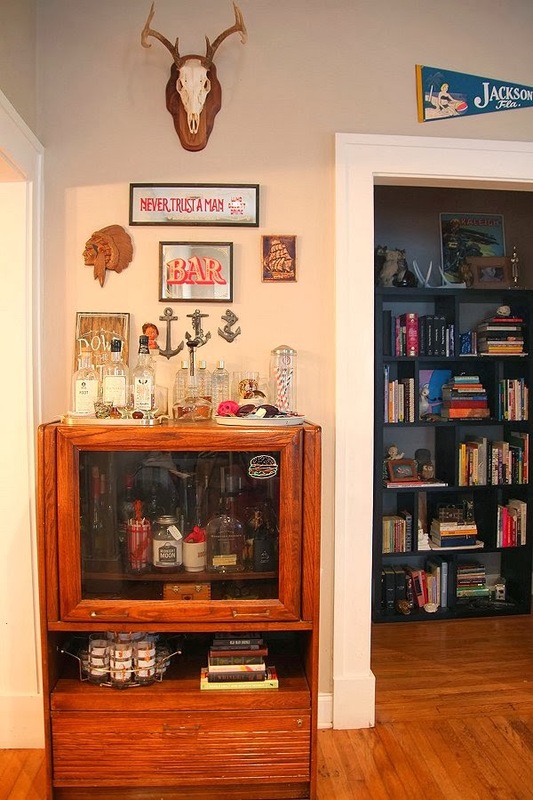 Nicole has an amazing collection of art and vintage finds, all beautifully displayed. Let's take a look! When you first enter there's a beautiful paint by number collection to the right and a nice bench and chair for taking off your shoes and getting comfortable. 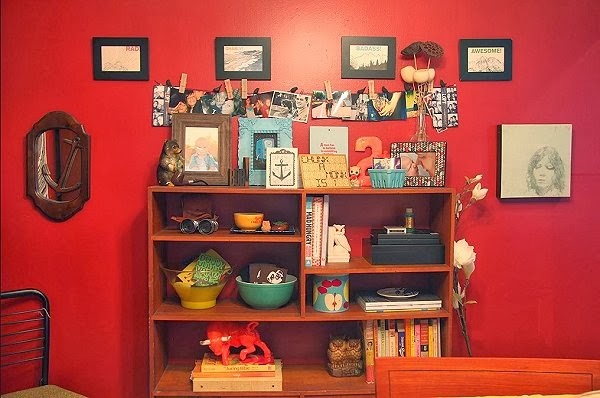 I love this display on the right wall of personal photos and keepsakes. 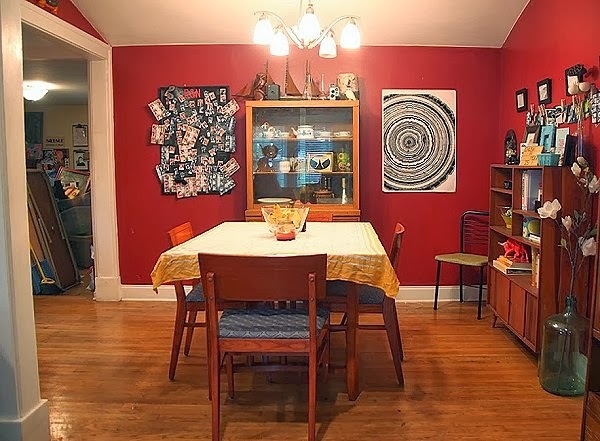 The right wall has a built-in china cabinet. 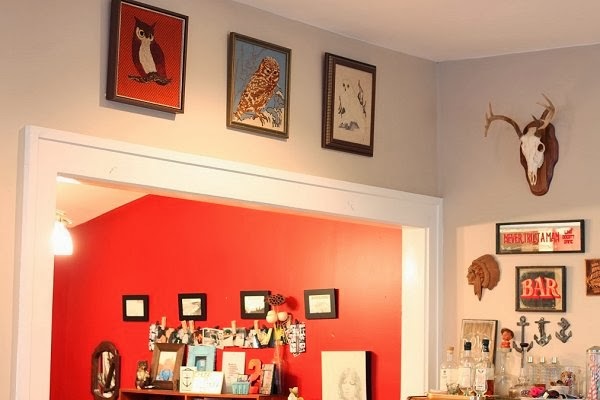 I love the collection of framed owl needlepoint artwork above the living room area too, each with a different bright background! Beside the dining room there's a gorgeous mini-bar, this one brings me back to drinks and big shop planning a couple years back when we were actively trying to open up a vintage shop! Inspiring times, can't wait to get back to collaborating! 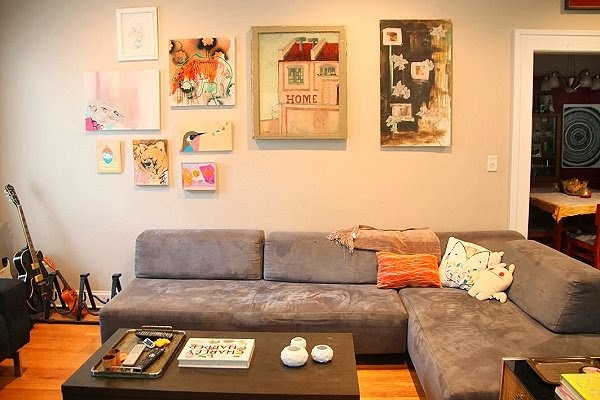 The living room has a gorgeous sectional and a gallery wall featuring local and nearby artist's work. The bear piece is by Nicole. The couch is the perfect fit for a small family, very cozy, inviting, and comfortable. 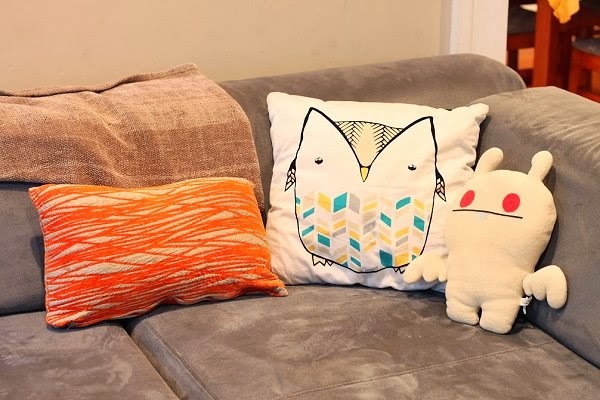 Love this duo of pillows and the white Ugly Doll! 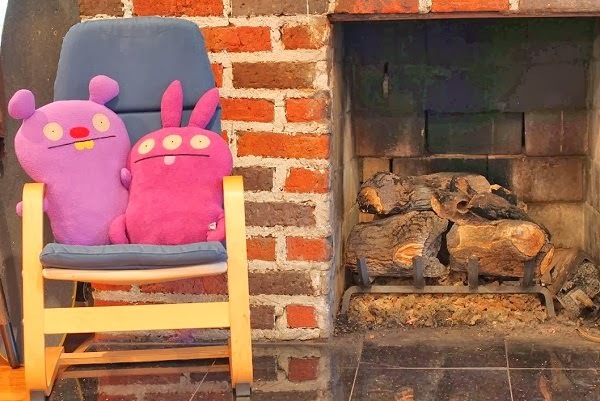 And across the way, two more ugly dolls chilling by the working fireplace. I adore Ugly Dolls, I can never hold on to them long before they sell. The TV Corner showcases the gorgeous velvet painting collection. The juxtapose yet go per5fectly with the sleek modern TV and entertainment center. 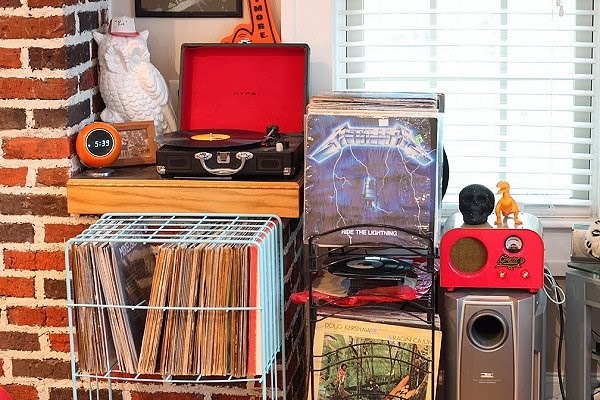 I really appreciate this little record/music media corner. I saw some of my favorites in there, like Purple Rain, of course. You know I love my Prince! 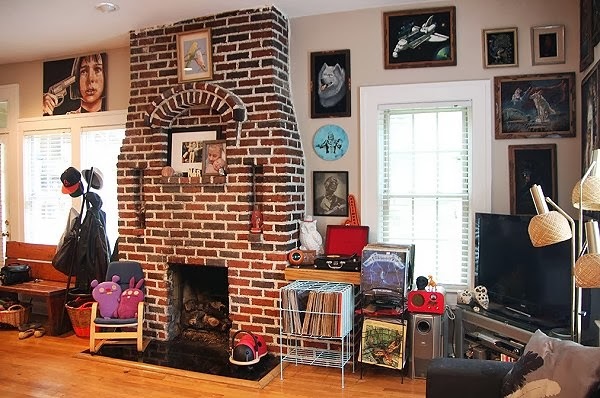 The gorgeous brick fireplace makes me want to find some bricks and built my own right now! It makes such a gorgeous focal piece. The hallway is another gallery showcase with more local art pieces and estate sale/thrift store finds. I need to check some books out of this library! 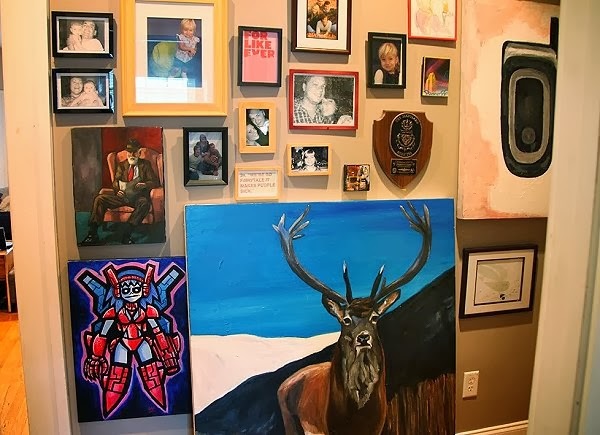 Her hallway inspires me to get all my favorite art pieces framed and hung in a hurry! So much to get on my walls. I like it with lots of stimulation like this space! As you can tell by the packed walls Nicole's outgrown her wall space, I know she's excited to fill up her new home. 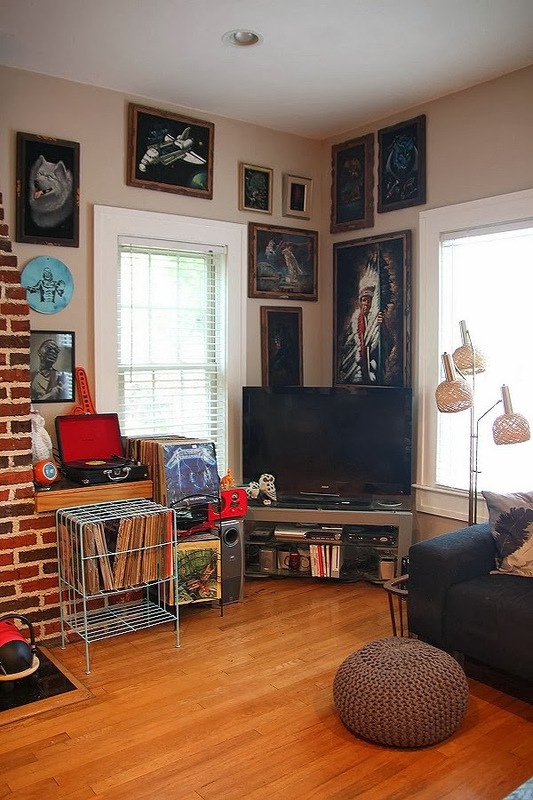 I love all the pieces on this wall, especially the fish, skull, zombie, and squid! And this sweet recent edition from a year ago is the corner of Nicole's bedroom set up for her one-year-old son Emmett. With the next house he'll have a room all his own! 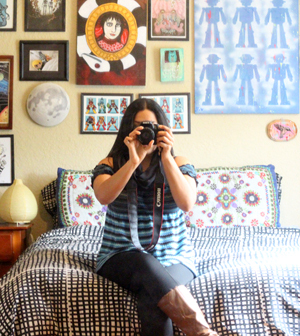 Nicole's house is cozy and lived-in and full of beautiful thrifed bits and art to behold. I'm excited for her to set-up in her new home, she has plans to make a lounge with built-in bar and pool table. Looks like we have a lot thrifting and estate sales to hit-up! 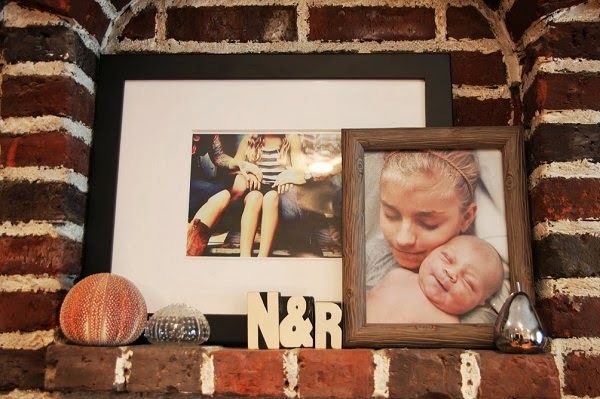 What's your favorite element of Nicole's space? This has me inspired to rearrange and get hutning for sure! Me too, but of course :D Now I want more skulls around my pad, never enough! Like seeing the art up. Bare walls make me uncomfortable! Me too, VERY uncomfortable! A house full of Stuff (but not hoarder-full) is so stimulating! I know, right? Me and Nicole need to start and interior design business :D Would be so fun! Me too :) She has an awesome collection! Nice apartment, looks like it has good bones. Love that fireplace! I've been wanting to rent that house after her ever since I learned she'd be moving. It's nice! Wish we had time to document the whole thing. Me too, motivates me to get all of mine out of folders and unto the walls! I'm jealous of all her wall space!! My house is lacking in wall space, can't hang too many framed pieces. 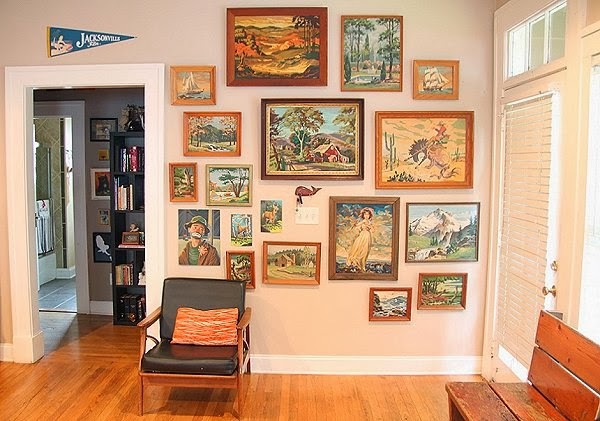 Her gallery wall of them is epic, I love the little wooden whale shaped key ring she has hidden in there, too. Oh my goodness - I love everything! Do you think she'll mind if I move in with her at her new house? such a great house! i am so envious of her great paint by number collection! i have one too, but i see a BUNCH that i would love to have! Yeah, she has some great ones. The colors are gorgeous! It's a great set she has, none of them too garish. They all go well together! My favorite is the space shuttle one, forgot to ask if it's the very same one I'd lusted after from another nearby antique mall. That is a pretty sweet paint by numbers collection. 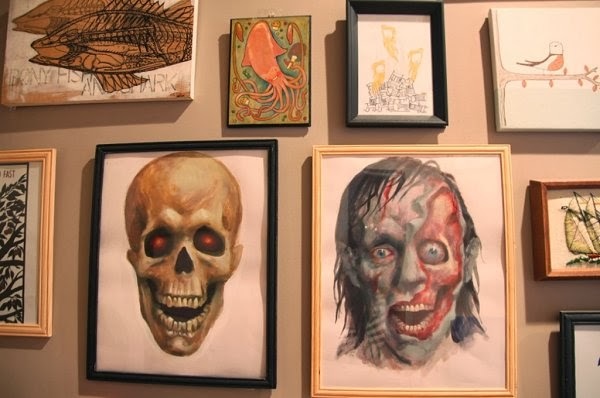 I also like all of the other art, it's always cool to see other people's art collections. Gotta love people who like to display things! I can appreciate even the most bare-bones Minimalist approach, but I <3 my tchotchkes! Love that sectional! I'm in need of a new couch and I dread it! I've always had "hand-me-downs" - One I suspect could test positive for TB. But I'm a super whimp about delivery. Do you have to be there? How much to tip? Ohhh, the anxiety. Couch fairy please just leave me one on my front porch! This show how much I need my collections out and on the walls! 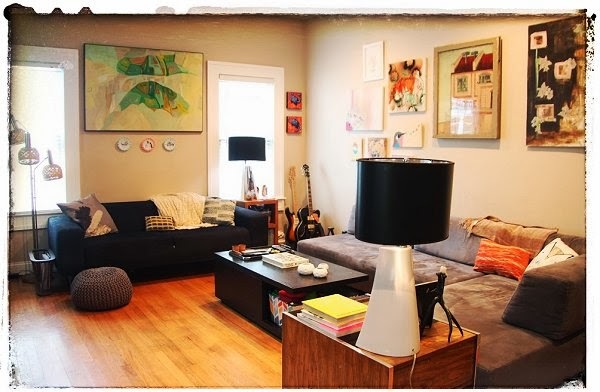 Same here ;D Been working on scrubbing down and re-arranging the apartment with all the inspiration going on. I love that place! What fun! My favorite houses are ones with tons of interesting things to look at. Yep, that type of pad is always fun to explore! 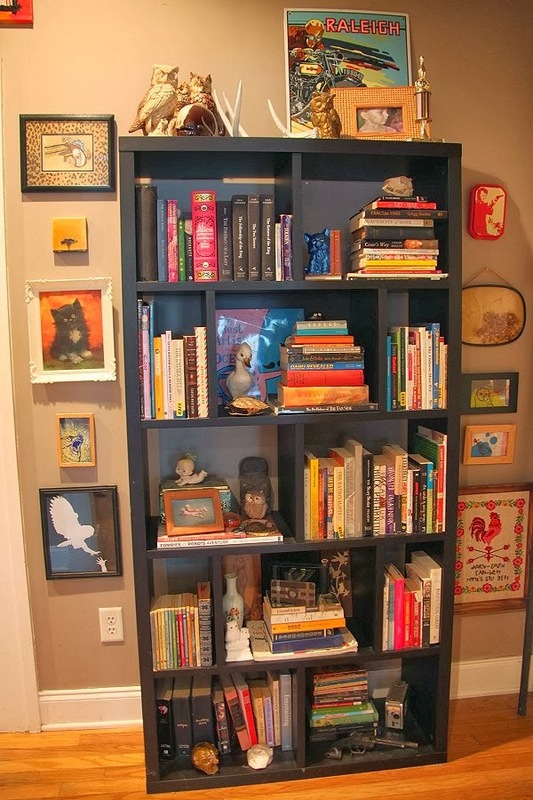 Love the paint-by-numbers display and (of course) the Ugly dolls scattered about! Me too! All of these apartment tours has be re-vamping and purging my space :D Very inspiring. Those are "Ugly Dolls" I love them and can rarely hold on to them for long when I find 'em. Highyl collectible! Oh! What a fabulous house! That's my kind of place, for sure. 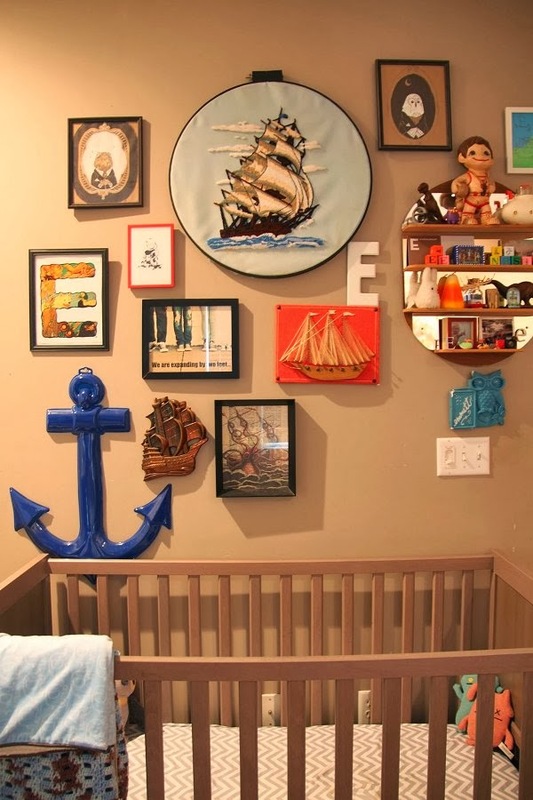 I especially love the little nautical collection above the crib. It never ceases to amaze me what can be found in thrift stores and all the creative ways they can be juxtaposed to create something fresh. 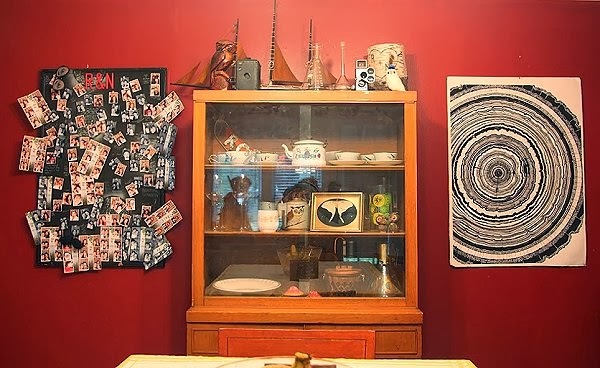 My friend Michael has collected self-taught, outsider, African-American art from thrifts for a couple of decades and shares some of it (over 100 pieces I think) on his website, http://www.diartspora.com. It makes me want to go out thrifting every time I see it! Lots of fun stuff to look at! But, it DOES look like a Thrift store....some good, some awful. Creative though! The home looks so artistic.